I go back and forth on that. If my MC was a coupe, I would definitely have regretted selling it, but eh. Now that I'm old and have a little person I now have to take care of, I am even more about cars for cruising. I've noticed myself starting to not want the loudest exhaust, I appreciate a decent ride quality even more, etc. Getting back into a convertible may happen. I do miss the nice nights with the top down - those were great. Eh who knows. I change my mind a lot lol. 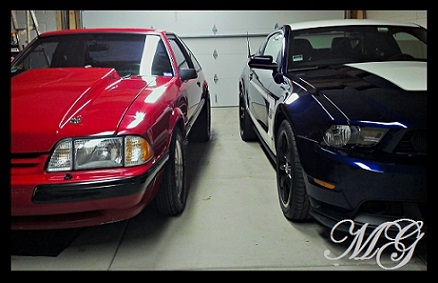 Heck right now I just miss having a Mustang in general! This weather is making it more tough. It needs to snow again so that even if I had one, I wouldn't be able to drive it LOL. I just hope I have one by the opener! Last edited by BEAST; 03-29-2019 at 03:09 PM. I too am liking a quieter, more comfortable car for cruising. The boss is great for that. I do like the S550s too. I had an Ecoboost convertible as a rental in Florida a couple years ago and really liked it. It would have been perfect if it was a 5.0. Last edited by MGLT; 04-02-2019 at 01:23 PM. I do like the S550s too. I had an Ecoboost convertible as a rental in Florida a couple years ago and really liked it. It would have been perfect big it was a 5.0. I may! I miss the Boss. But I also miss that blower whine. What I don't miss is the car payment LOL. Someone needs to make an offer on our house for way more than we're asking so I can get whatever I want and still not have a payment LOL. It's going to be 70 on Monday. Took Monday off. Had two knee surgeries recently & I'm joanzen big time to drive. I think I've put about 400 miles on my car in past 2 years. Which is pathetic. Why own the fucker. If you own a car & it sits, buy a dman model if you want a conversation piece.